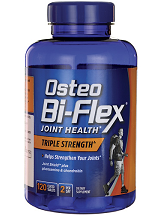 Osteo Bi-Flex focuses on improving joint muscle integrity and increasing mobility while eliminating stiffness, cramps, and inflammation. This supplement aims to bring back the jump back in a person’s steps. If you are interested in this joint relief supplement and wish to learn more, continue reading our in-depth review below. This is taken as a dietary supplement with a recommended dosage of 2 capsules per day. It is recommended to take the supplement with food. For best results, light exercises and proper diet should be done daily as well. It is imperative that you always follow the recommended dosage. Osteo Bi-Flex Triple Strength is available at various pharmacies and stores. You can check the manufacturer’s official website to find the closest store to your location that offers Osteo Bi-Flex. Prices will vary based on the store you decide to purchase from. The price seems to range from $16.49 to $31.99. The Osteo Bi-Flex uses an ingredient called glucosamine which may cause mild side effects with such as nausea, gastrointestinal complaints, heartburn, cramping, and drowsiness. To prevent this from happening, it is best to follow instructions and always check with your doctor when trying new supplements or medications. For people who are pregnant, under the age of 18 and those with a present medical condition, it is important to first consult your physician before using this dietary supplement. After checking all relevant information on their official website, we were not able to see any mention of a customer guarantee. Unfortunately, if this joint health supplement does not deliver the results you were looking for or if your body somehow reacted negatively to the supplement, you will not have the luxury of requesting a refund from the manufacturer. Osteo Bi-Flex Triple Strength should offer adequate support to your joints and help prevent joint problems from occurring. It uses a list of effective and relatively safe ingredients that are well-known in the medical world of promoting good joint health. The price varies between retailers so you will have to do your own research to find the retailer with the cheapest options. The lack of customer guarantee may be a concern, especially for first-time customers who are still unsure whether this product will deliver on its promises. There are other joint products on the market that do come backed with a guarantee.